I was lucky enough to join Ezra Cipes, chef Jesse Croy (above), and a handful of Kelowna food enthusiasts at the winery’s first Chef’s Table event of 2012. 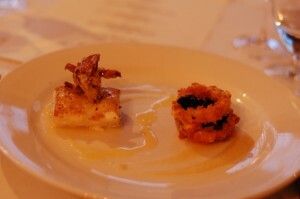 Each of the seven courses was paired with a wine from Summerhill’s portfolio. A variety of textures and presentations were infused with fresh spring flavours in dishes that were all expertly imagined and executed by Croy and his team. First course: Sunchoke puree with ginger snap foam. 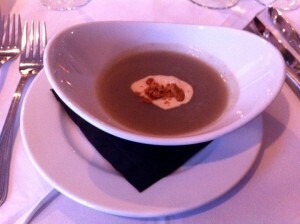 Nice pureed soup with the ginger providing a nice bit of zing to complement the richness of the sunchokes. Wine pairing was the Cipes Brut, with notes of lemon, spice, and bread, and whose lively acidity was integral to the course as a whole. 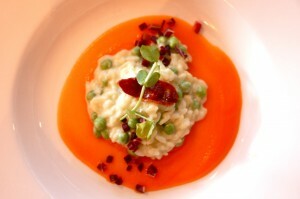 Second course: Pea risotto with carrot puree, chevre, and duck prosciutto. This was a very fresh, light spring risotto, with great textures and crisp flavours. The wine pairing was the slightly sweet Ehrenfelser with notes of nectarine and honey, which complemented the sharpness of the chevre in much the same way that dessert wines generally do. Lovely pairing. Third course: Halibut with chanterelle mushroom calamari, cipolini onion rings, nettles, and meyer lemonade butter. Although this course could have used some more lemon in my opinion, the delicacy of the halibut was a highlight of the evening. The ‘08 Syrah, with notes of red fruit, white pepper, and mint, went well with the onion rings and nettles, if not the fish itself. 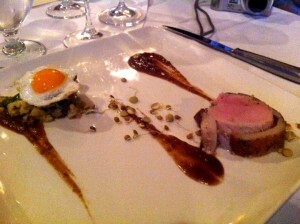 Fourth course: pork with potato salad, sunnyside quails egg, and housemade HP. Beautiful piece of pork, wrapped in fat with the consistency of butter. The uber-clean finish of the pear-and-grapefruit-infused Organic Pinot Gris was the perfect foil for the fat and flavour of this delicious, meat-and-potatoes course. 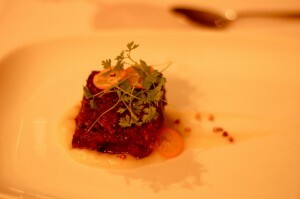 Fifth course: pressed lamb neck date square with kumquats. According to chef Croy, this took five days to prepare. The result was akin to the best, meaty, caramelized bits of sweet BBQ ribs, with the bitterness of the kumquat to render the square’s sweetness balanced. The ‘08 Cabernet Sauvignon, was a great match: its spicy-herbal character provided a nice contrast to the sweetness of the square. 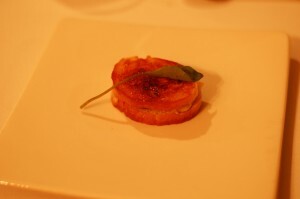 Sixth course: Honeycomb grilled cheese with brie, blue cheese, and parmesan. Simple, buttery, cheesy, tasty— definitely a crowd-pleaser. And who doesn’t like eating with their hands? The peach and pineapple flavours of the Diva’s Delight wine evoked once again the classic combination of sweet wine and sharp cheese. 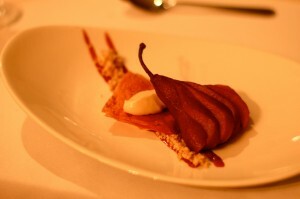 Seventh course: Syrah-poached flemish pear with spiced syrah syrup, quince mousse, and hazelnut soil. Sort of a deconstructed pear tart— the Zweigelt icewine, with it’s spice-and-fruit profile was a great like-and-like match, a welcome change following an evening of contrasting and complementary pairings. If you are a food lover in the Okanagan and have the chance this year, it would be well worth a visit to one of Summerhill’s Chef’s Table dinners; if you can’t get a ticket, you can still enjoy chef Jess’s artistry at Sunset Organic Bistro any day of the week. Interested in attend the next Chef’s Table at Summerhill Winery? 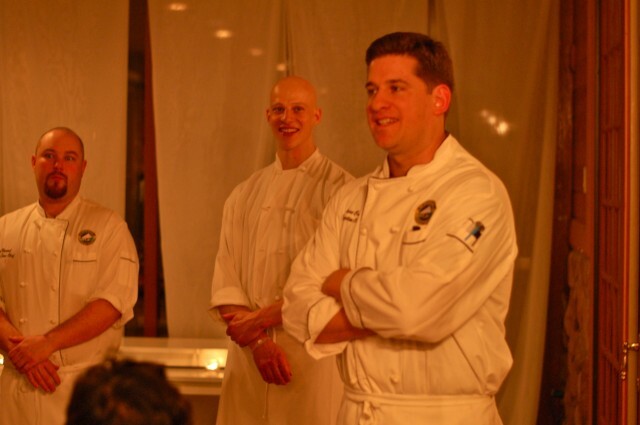 There are two more spring Chef’s Tables: Thursday, April 26 and the Finale, Thursday, May 31. Another plus about the Chef’s Table at Summerhill…the cost is only $70 per person if you only want the food courses, another $30 if you desire the wine pairings. Contact Summerhill to book your spot!